At the Paley Institute, we recommend surgical treatment for posteromedial bowing of the tibia for correction of angular deformity and lengthening of the leg. Traditionally, the timing of treatment was later in the child’s life, but some surgeons have spearheaded performing the surgery earlier. 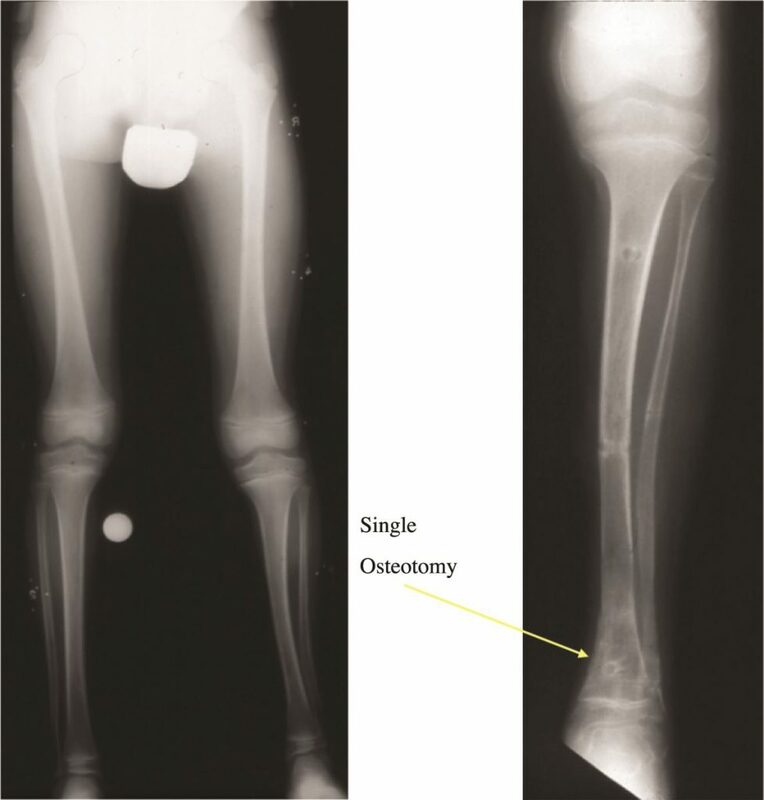 Dr. Paley began operating on patients with posteromedial bowing of the tibia as early as age two since 1990. Many of his patients are now adults and have normal ankles and normal alignment with equalization of limb length. One case example is a girl who recently wrote him talking about how she is a competitive college tennis player many years after successful treatment for her posteromedial bowing of the tibia. Her testimonial is included. Perform a uni-apical or bi-apical osteotomy, depending on the magnitude of the deformity (see Figure below). 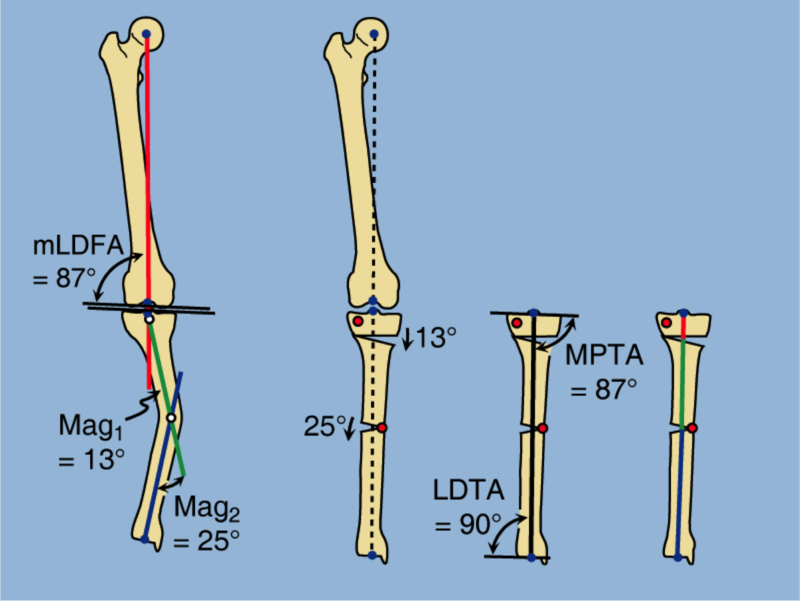 Apply a computer-dependent external fixator, such as the Taylor spatial frame (TSF) to gradually correct the angular deformities and lengthen the leg. Complete the lengthening and straightening of the leg gradually with the external fixator. Wait until the bone is fully consolidated and then remove the external fixator and apply cast for one month. Resume activities and perform physical therapy to fully recover from lengthening and straightening process. 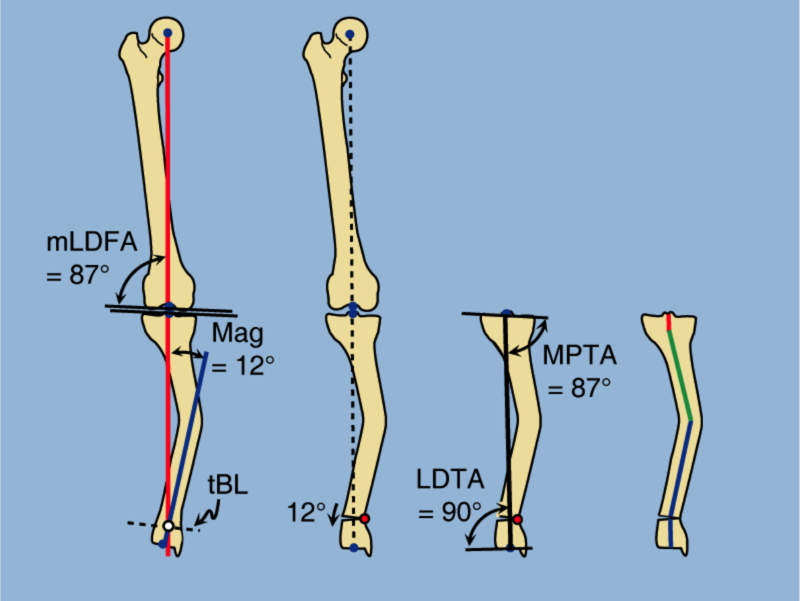 Limb lengthening may need to be performed more than once depending on the predicted limb length discrepancy. This is especially true since treatment is started early. It is possible to lengthen up to about 5 cm in children under the age of four and then again another 5 to 6 cm in older children. Uni-apical osteotomy. While there is an overall alignment between hip, knee, and ankle (red line), there is a 12 degree angular deformity of the tibia (blue line). A single osteotomy near the ankle and elevation of 12 degrees realigns the tibia. The knee and ankle are in normal orientation. The axis of the tibia is zigzagged (green line). Bi-apical osteotomy. The line between the hip and the knee does not pass through the ankle (red line). There are two different centers of rotation of angulation (CORA) at the tibia. One is 13 degrees (green line) and the other is 25 degrees (blue line). Two osteotomies are performed and the knee and ankle joint orientations are returned to normal. The red, green, and blue lines are all one axis. The anatomic axis of the tibia is straight and completely aligned. The results of surgery for posteromedial bowing of the tibia, if treated early, is a normal leg with normal alignment and normal length. The results if treated late, before degenerative changes of the ankle joint occur, can be equally as good. The results of treatment if treated late, after degenerative changes to the ankle joint have occurred, treatment may include an ankle fusion and possibly subtalar fusion to treat the degenerative changes. Dr. Paley has extensive experience in treating posteromedial bowing of the tibia, as well as almost 30 years of experience in limb lengthening and deformity correction. 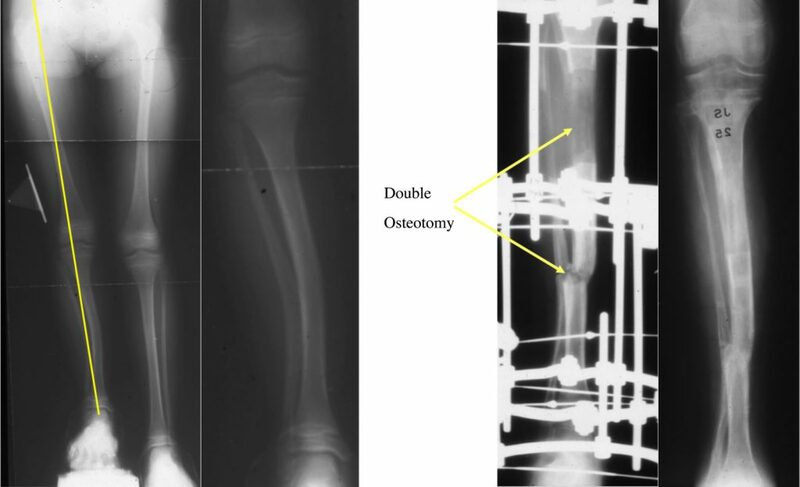 Many of Dr. Paley’s patients with posteromedial bowing of the tibia are now adults with completely normal ankles, normal legs, and no limb length discrepancy.